Although, to an extent the rise of feminist slogans has improved the status of the women's condition worldwide, the access to education is still one of the most pressing demands. Women constitute almost half of the world's population and empowering the women can give birth to a nation, which is more knowledgeable and literate at the forefront. Accordingly, with a motto of empowering the women and giving them feather to fly high, Late Shri Nanalal Bhatt laid the foundation of Shrimathi Devkunvar Nanalal Bhatt Vaishnav College for Women in the name of his wife, Smt. Devkunvar. "The Founder Chairman of the institution used to accord a significant importance to women's education. As he always believed that women can bring social stability by finding solutions to different problems prevailing in the community and the society," says Dr. V. Varalakshmi, Principal, SDNB Vaishnav College. Shrimathi Devkunvar Nanalal Bhatt Vaishnav College for Women was started in 1968 with the generous donation of 10 acres of land by our Late Founder Chairman Shri Nanalal Bhatt and Rs. 6 lakhs donated by Cork Industries Charities Trust. Identifying the need of introducing management education for the young women, the institution now offers 10 UG Courses & 6 Research Departments in the Aided structure, 12 UG Courses, 11 PG Courses & 4 M.Phil courses in the Self financed structure. BBA (Business Process Services) and B. Com courses offered in a number of specializations attract a number of students. The efforts and quality of the SDN Bhatt Vaishnav College can be well observed by the milestones it has managed to achieve till date. The most recent collaboration of the institution with Tata Consultancy Services (TCS) has become the hallmark of the SDN Bhatt Vaishnav College. "The three-year full time degree programme in Business Process Services (BPS) we are providing to the students is a one of its kind course, which has been possible because of this alliance with TCS Academic Interface Programme," shares Dr. Varalakshmi. This MoU has been signed on 26 April 2017, rendering the students with an opportunity to be hired by TCS on successful completion of the degree. The degree programme focuses on shaping the career of the students with specific relevance to BPS industry, conserving the core emphasis on the BBA programme. Both the students and the institution have been able to cater more recourses and expert guidance on aspects like curriculum design, guest lectures, participation in BOS, Academic councils and so on, through getting in touch with TCS experts. Moreover, the institution has been accredited as the only college in the city to sign MoU with all the three institutes enacted by an Act in Parliament viz. Andhra Chamber of Commerce, Institute of Cost Accountants of India, Institute of Chartered Accountants of India (ICAI) and Institute of Company Secretaries of India (ICSI). These associations serve many purposes, but the one thing that they all have in common is that they create an open flow of knowledge, capacity building and other realms that contributes to the foundation of an elite institution. "All Commerce students are doing a BAP-Executive online course conducted by Arthavidya partnered with NSDC & e-palmleaf ITES Pvt Ltd which helps them in placement. Our College will be a signing a MOU with International Chamber of Indirect Tax Professionals for organising a certificate course on GST," says Dr. Varalakshmi. Making the student feel comfortable and safe at her college campus, the institution has taken precise care in constructing a campus that is guarded by security personals 24x7. "We have included all the possible facilities a female student would be looking for," shares Dr. Varalakshmi. Facilities like canteen, ATM, spacious hostel, indoor stadium, digital library and so on being provided in the campus, nothing has been left by the institution, which falls under the necessity of the students. Hence, the efforts and quality of the institution can be well observed by the milestones it has managed to achieve till date. Among all the success stories of the college, the recent noteworthy achievement is the Re-accreditation of the College with A + grade (3.52 on 4 point scale) by NAAC in the 3rd Cycle in January 2017. 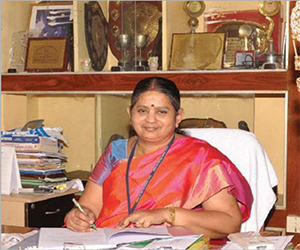 "Being the first women's college in Kancheepuram District, Tamil Nadu, the administrators of the institution have never compromised in maintaining the quality of the teaching-learning process, infrastructure and placement rates," opines Dr. Varalakshmi. "From the very initial days, we diagnose the students who want to earn jobs right after completing their course rather than pursuing higher education or taking up entrepreneurship activities and accordingly we start grooming them for their final placements," claims Dr. Varalakshmi. The institute has an incredible placement record of 100 percent with companies like Capgemini, Accenture, HCL, HDFC, McKinsey, Virtusa, Mpower Young India, Wipro and so on hiring the students, owing to the gracious relationship the institution has nurtured with the industry. Giving equal significance to entrepreneurship, under the dynamic and influential leadership of the present Chairman, Smt. Mamta D. Bhatt, the institution has geared up to provide women's entrepreneurship activities to the students, making them accustom with the nuances of business. The college has an active Entrepreneurial Development Cell (EDC) that organizes events like 'Vaish Bazaar' to instill entrepreneurial spirit among the students. Furthermore, the college has entered into a MoU with Entrepreneurship Development Institute of Tamil Nadu to foster entrepreneurship enlightenment among students. The institution also assists the students to set up consultancy services by helping staff and students to obtain PAN cards and organize food carnivals in the campus, which in return fuels their revenue rate. "Recognizing the sole motive behind the establishment of the institution, we are determined to touch every spectrum of women's education and ensure their productivity. In coming years, we are aspiring to be recognized as a college with Potential for Excellence by UGC and keep evolving our course curriculum according to the demands of the industry," concludes Varalakshmi.